Have you heard the news? The Super Nanny season premier is Friday, today! Who knows what this season will bring? I am hoping some developmentally accurate information will be shared on the show. The advertisement for the Super Nanny show again depicts the Super Nanny as someone every family needs for healthy parenting. Parents, try to remember when you watch, that you are your child’s best teacher. The reason your kids behave better for others, including the Super Nanny, is because no one unconditionally loves your kids the way you do. While it is frustrating that your kids treat you badly, it also means your kids feel safe enough with you to misbehave. In other words, your kids know you will love them anyway. Watch this season with a discerning eye. You know best as parents. Keep in touch and let me know what you think of the show this season. ABC and NBC are flooding the T.V. market place with parenting advice. Between the Super Nanny and The Baby Borrowers you’d think America’s parents don’t have clue about how to care for their own children. Well I think that is insulting the intelligence of parents. It makes me mad! The teenagers that are trying to parent generations of children, including kids that are basically the same age as the teens themselves are portrayed as stupid, confused and irresponsible. I think that is a gross misrepresentation of what adolescence is all about. Teens are not inept people, as they are depicted in this show. The one redeeming message that I gathered after watching both these shows this week is that there is some damage to children when parents fight. As one of the teens wisely and acutely pointed out, “When parents are in conflict, parenting goes out the window”. Kids of all ages believe when parents fight that somehow they are responsible for the conflict. Now, don’t get me wrong, we all, myself included, get mad at our kids, our spouses, our relatives and neighbors. So fighting is inevitable. But, as parents, we need to understand the consequences of our angry behavior in front of our children. While watching The Baby Borrowers I could visibly see how the teens’ body language changed as he listened to his surrogate teen parents fighting. His head and shoulders dropped as he I am sure felt completely out of control, because he could not stop the conflict. Parents, think before you act on your ‘mad’ emotions in front of your kids, because kids may take on your conflict themselves. Ask yourselves how do we want our kids to express their anger and then take the time to teach your kids what to do when they are mad and you model that as parents when you are mad. Now that I got all my mad out, I definitely feel better. Do you have a strong-willed child? Super Nanny gave us a taste last night of how we label kids with this term. There are tons of books out there on ‘strong willed’ kids. But, have you ever seen a book on the strong willed parent? I have never seen one, so I think not! The truth of the matter is, in order to have a battle of wills you need two people. The nature of childhood is filled with conflict for parents. A child’s job is to become independent. A parent’s job is to keep their child safe by saying ‘no’ to all their daily unrealistic demands. So daily conflict is inevitable. Parents, every time you think to yourself that your kids are being unreasonable, remember it is part of their will to be strong. This strength helps them figure out what they can and cannot have and what belongs to them so they can understand who they are. Now does this mean that we as parents shouldn’t stop our children’s will when it is inappropriate? The answer is of course not. But, instead of labeling kids as strong willed, I think we should re-teach our kids what behaviors are ok and what aren’t. The formula for solving problems with your kids is as easy as remembering these “5” steps. Name the behavior that is bugging you as a parent, don’t just label it as strong-willed. Watch what your child does instead of just reacting to them immediately. Don’t try ‘everything’ in order to stop behaviors in your kids. Stick with one plan even if it doesn’t work on any given day, as it is normal for your techniques to work some days, but not all. If what you are doing is never working; try the opposite of what you are doing. For example, if you are yelling, try whispering. Expect your child’ strong will to rear it’s head often and when it does take a deep breath and say, “My child’s persistence might just be what lands them an executive position at Microsoft”. So channel your child’s will instead of labeling it as bad behavior. Sorting Out the SuperNanny… Time-Outs NEVER change behavior. t the risk of sounding like a broken record… I’ve said it before and I won’t stop saying it, “Time-Outs NEVER change behavior; they only stop behavior”. So, parents don’t fool yourself into thinking that because you remove your child for a certain amount of minutes in a certain place (in this weeks case it was a bean bag) they will stop misbehaving. Remember, “THINGS & PLACES DON’T CHANGE BEHAVIOR, PEOPLE DO”! The purpose of a time-out is to give a child a safe and alone place to land when they need to be away from their parents. That place gives the children the opportunity to talk to themselves about what went wrong with their behavior. Plus, getting in your kids faces in the middle of misbehavior only teaches your kids to continue to do that behavior in order to get their parents attention, even if that attention is negative. Parents start talking to other parents about time-outs and what they are designed to do. Let’s put together a parenting team. You, all the parents out there and me who want to our kids to know what a healthy relationship looks like, because that is up to us! Shame on you Super Nanny! I find myself having to sift through all the negative messages the Super Nanny gives the parents to get to the good stuff. For the life of me I cannot understand why the Super Nanny shames parents. This week there were all sorts of great messages from the Super Nanny, like, “Teenagers don’t know how to parent and they shouldn’t because they are kids themselves” and “A father is the first role model to his daughters” and “To get respect you have to give it”. My message this week is knock-it-off Super Nanny. You don’t need to shame and blame to get parents to change their parenting. Just stick to teaching Dad how to re-connect with his daughters and modeling ‘in the woods’ for parents how to play with their kids to build trust. If you are not asking yourself ‘why’ should I follow the Super Nanny’s advice, you need to start now. Have you ever done something and then asked yourself, why did I do that? The Super Nanny’s advice goes uncontested every week. Every week I ask myself ‘why’ does she recommend that parents do that? 1-Kids need ‘to sit’ when they misbehave and sometimes struggle for hours in the process. 2-Parents are told to put their faces in their kid’s faces and tell them to ‘knock it off’ in the middle of the conflict. 3-Time is used as the measure to change behavior in children. 4-Kids are routinely asked to say, “I’m sorry” without ever teaching, kids what those words mean. Let’s start with #1 having kids ‘sit’ and if they won’t, keep putting them back. Having kids sit for a certain amount of time might stop behavior, but it NEVER changes behavior. Instead, when your child does something that is NOT OK in your family, stop interacting with them. When they do stuff you do want them to do again, make sure you look at them, talk to them and touch them. For example, if hitting is a problem, when your kids hit don’t connect with them by asking them ‘why’ and telling them to stop it right now. Instead, look for when they are using their hands for appropriate things (eating a snack or drawing or giving a high five) besides hitting and connect then by talking, touching and eye contact. #2 Getting into it with your kids will only make your kids want to communicate like that with you again, because they get a ‘piece’ of you even if your face looks mean. Instead, don’t give your face to your kids when they are misbehaving. Save that for when they are doing what is OK in your particular family. #3 Time NEVER changes behavior. It might stop it for the moment, but parents will have to use it over and over again which can be very frustrating. The only thing that really changes your child behavior is knowing that they will not get a relationship with their parents when they misbehave. All kids just want to know, what will keep me connected with my parents. #4 Don’t have your kids say they are ‘sorry’. Teach them to never do that again! How do you do that, keep your kids away from the child they wronged and when they are playing the way you want them to with the child they wronged, connect with them through touch, talk and with your eyes on them. Hey SuperNanny, it’s not all about you! A mom reluctantly standing on her own stairway landing as someone (Jo Frost) comes into her home to tell her how to parent is normal. The SuperNanny calling her ‘rude’ for not welcoming her with open arms is not! The SuperNanny taking the “big boys” in this family aside to ask their opinion without having mom and dad present further undermines these parents. The quickest way to promote discord in ANY family is to set up what is called a big, fat triangle. Which simply means one family member talks about another family member to another family member behind their backs. In this case, it is the SuperNanny talking to the kids about their parents, instead of encouraging face-to-face discussions between all family members. This divisive style of communication in families sets up a breeding ground for misunderstandings and lack of resolutions to problems. Everyone just runs around complaining to each other. So, parents always talk directly to your kids when you have a problem with them. This is the very reason why it is not such a hot idea to say, “Wait until your father/mother gets home”! I agree with the SuperNanny that this little girl was lost. I only wish the SuperNanny would of modeled for this mom first off how to connect with her own child. Instead, Super Nanny just talks about this little girl wanting to follow her around instead of her own mom, while she ‘bad mouths’ the mom’s behavior toward her child. As soon as the child started to follow Super Nanny, she should of lead this child straight to her mom and given mom a big hug to model connection between parent and child. Great idea SuperNanny to allow Dad to use his talents, words like in a sermon, to reach out to his own children. This gave the Dad confidence and allowed direct communication in the whole family. Can you hear my clapping hands for well done! Thanks, SuperNanny, for congratulating mom at the end of the show, buy why not start with a positive attitude and work up from there. Don’t think we have to show parents at their worst to teach lessons in parenting. Can you try to be positive all the way through the show and still get ratings? Don’t know the answer to that, but it might be worth a try. Who knows maybe your prime time voice can have a profound effect on how parents view themselves? A sensitive SuperNanny is who we saw this week. Hooray Prime Time for giving parents here at home an insight into the profound sorrow and loss a single parent feels while their spouse is off fighting in Iraq. A kinder, gentler Super Nanny suggests mom “bring some life back into her home”. Helping mom and the kids ‘see’ Dad via computer helped tremendously with their emotional connections. Kids always learn best through play, so SuperNanny’s suggestion of a ‘party’ and her physical support to mom throughout was terrific. Providing ‘dentist tips’ through model and practice and play made total sense. But, unfortunately, the SuperNanny was up to a few of her ‘old’ ineffective tricks to bring peace to this family. Two decades or more ago punishment like sitting in a corner and harsh words in a child’s face was used to get a child to behave. As the SuperNanny is telling the child to “zip their lip” and getting right in her face, I am thinking we are regressing instead of progressing in how we treat our young. The whole ‘manners’ piece was crazy. SuperNanny says, “Of course these kids know their manners, they just choose not to follow the rules”. The house rules about the manners is so abstract none of these kids “really” know what is expected, especially since the rules are everything they are not supposed to do. Super Nanny encourages mom to get down to her kids level when they misbehave with tons of talking and eye contact while sending them to the naughty bench. Please parents remember not to get into it with your kids in the middle of misbehavior, never label them as naughty and focus on teaching them what they are doing ‘right’. Don’t humiliate your kids by telling them ‘picking their nose is nasty’, instead tell them what to do with their fingers like eat a snack or paint or pick up trash. Lastly, this week Super Nanny keeps pounding into this mom’s face that she need to be the one in control. Yes, as parents we do need to be in control of keeping our kids safe and teaching them. But, remember if you don’t teach your kids where they can get some healthy control over things, they will continue to seek it anywhere they can get it! 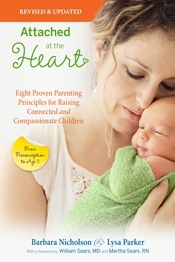 So excited to tell you about the release of the new Attachment Parenting International book Attached at the Heart. The attachment parenting philosophy that “understanding of what children need from us to develop into whole and happy adults” fits perfectly with my new project Pocket Full of Feelings! I recommend you pick up your copy today!